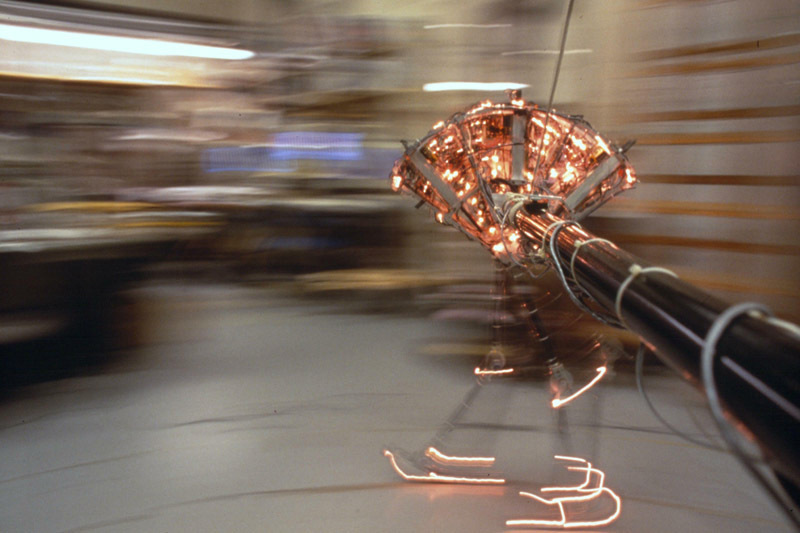 Spring Flamingo was designed, built, and controlled by Jerry Pratt in 1996-2000. The actuators were based on a design and prototype by Mike Wittig done for his Undergraduate Thesis in 1995-1996. Robert Ringrose helped with the development software which was a modification of his creature library and other lab simulation software. Dave Robinson helped with design advice, foot design, and machining. Dan Paluska helped with assembly. Ann Torres helped with machining and named the robot based on its appearance. However, Spring Flamingo doesn't walk like a flamingo, nor is it intended to. The robot has an actuated hip, knee, and ankle on each leg. 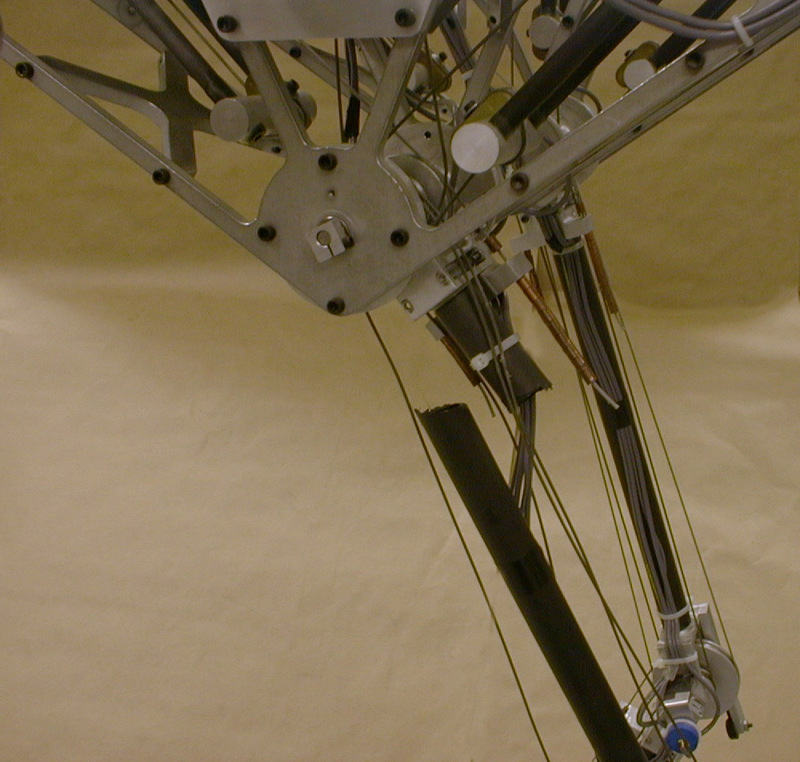 An unactuated boom constrains Spring Flamingo's roll, yaw, and lateral motion thereby reducing it to a planar robot. 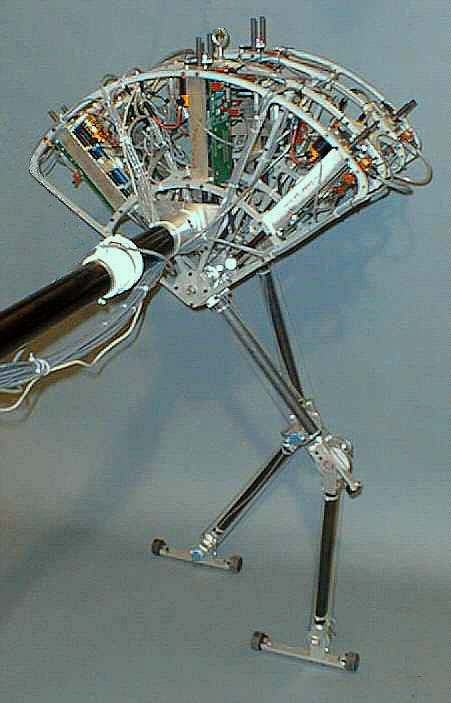 All of Spring Flamingo's motors are located in its upper body, with power being transmitted to the joints via cable drives. Series Elastic Actuation is employed at each degree of freedom, allowing for accurate application of torques and a high degree of shock tolerance. The maximum torque that can be applied to the hips and ankles is approximately 16 Nm while approximately 24 Nm can be applied to the knees. The force control bandwidth we achieve is approximately 20 Hz. Spring Flamingo weighs in at approximately 30 lbs (13.5 kg) and stands 3 ft (90 cm) tall. Rotary potentiometers at the hips, knees, ankles, and boom measure joint angles and body pitch. Linear compression springs are located in the actuators to implement Series Elastic Actuation. Linear potentiometers measure the spring compression. In all there are six actuators and thirteen sensors on Spring Flamingo. We have implemented simple walking algorithms for walking on flat terrain. With these algorithms, we have successfully compelled the robot to reliably take consecutive un-aided laps as shown in the MPEG video below. As of April 8, 1998, we have developed algorithms for sloped terrain up to 15 degrees, as shown in the MPEG video below. 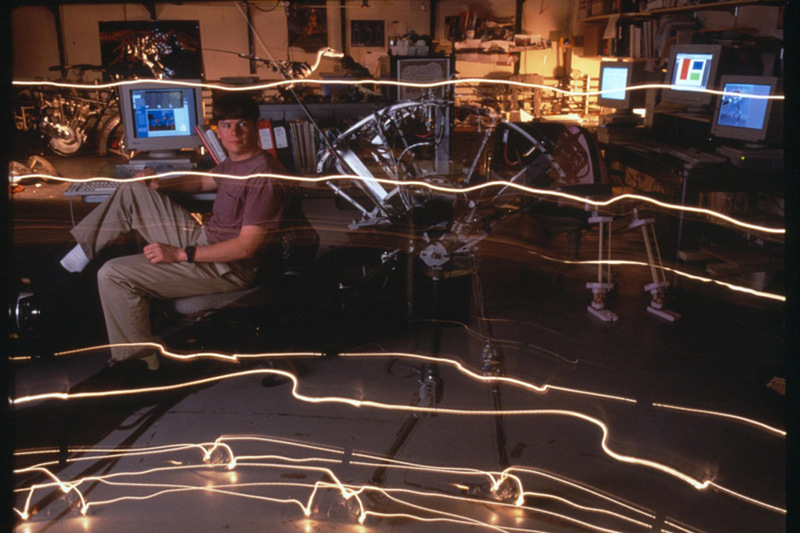 As of Summer 1999 we have developed walking algorithms for fast walking up to 1.2 meters per second. Some of these algorithms exploit the natural dynamics of the robot to allow for simpler control with a more graceful result. 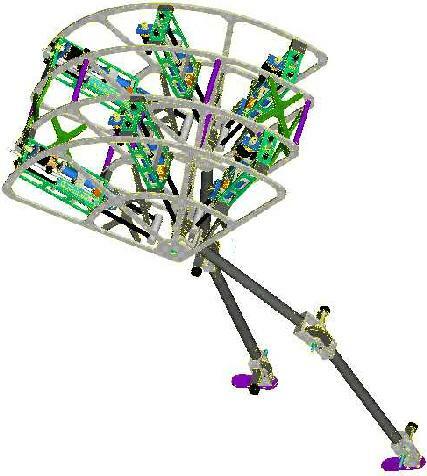 Spring Flamingo was designed using Pro Engineer from Parametric Technologies for the mechanical parts and TANGO from ACCEL for the electronic schematics and circuit board layout. The robot took approximately 18 months to conceive, simulate, design, build, make corrections, program, debug and get to walk continuously. A list of time break down by month and day has been compiled. The actuators were designed and prototyped before the rest of the robot. All six actuators are identical and can be easily swapped with spares. The body plates were designed based on the size and travel of the actuators. The boom and feet weren't designed until the rest of the robot was built. Knee caps were added later in order to make the control easier. Mechanically, we had trouble in two areas: free-wheeling ball screws and breaking cables. The ball screws were fixed by pre-loading the balls. The breaking cables were fixed by going to a more flexible cable and designing some parts which increased the radius at places were the cables were breaking. The robot cost approximately $25,000 in parts and $75,000 in labor. A detailed list of expenses , information on suppliers and complete part list has been compiled. Most of the designed parts were machined in the MIT AI Lab's machine shop. The body plates were cut on a water jet in MIT Building 35 machine shop. Some of the parts were sent out to REC Engineering. All of the electronics are on circuit boards which were fabricated by CFC. All parts were soldered in the lab. Spring Flamingo was initially designed to somewhat model a long legged bird like creature. Hence the bent-backward style "knees". In a real bird, that joint would really be the ankle and the bird would have an additional knee joint above it. Starting in September 1998, we decided to come up with algorithms which exploit the natural dynamics of the robot. In particular, we were interested in passive swing leg characteristics. In order to achieve these passive characteristics, the robot needed a bent-forward knee. Therefore we turned the feet around and had the robot walk the other direction with a human-style configuration. The following picture taken by George Steinmetz is a strobe photo of the robot walking with an algorithm that exploits the natural dynamics of a kneecap, compliant ankle, and passive swing leg (see paper below for more info). The following pictures were taken by Peter Menzel on January 12, 1999. The photos involved a long exposure shot, a single flash, and two strings of Christmas tree lights. Click on the photos for higher resolution versions. On January 29, 2000 Spring Flamingo broke a leg while walking. The cause was previous wear due to the leg bone (carbon fiber tube) hitting against the body plate during falls and other mishaps. This caused dents in the tube which eventually lead to its breaking in two. The leg was quickly repaired by replacing the broken tube. In 2002 Spring Flamingo started a 6 year tour to visit 6 Science Museums along with a number of other robot displays as part of the Robots+Us exhibit created by the Minnesota Museum of Science. Knee Bends. (234K MPEG) This video shows Spring Flamingo performing knee bends with its feet together It is using its ankles to actively balance. Walking. (1332K MPEG) Same walking but higher resolution. (4627K MPEG) This video shows Spring Flamingo walking. Spring Flamingo takes a couple laps, traveling about 14 meters in about 28 seconds for an average speed of about 0.5 m/s. Walking over a small ramp. (538K MPEG) This video shows Spring Flamingo walking over a small ramp. The walking algorithm is unmodified from the one above and the robot does not know that the ramp is there. As of 8/20/97 the robot could only successfully walk over the ramp 50% of the time. The following is raw data from Spring Flamingo walking with a bird style configuration on flat ground (ASCII format). One variable per file, all in one column (just the way Matlab likes it). Data that appears in the ICRA '98 paper "Intuitive Control of a Planar Bipedal Walking Robot". Robot walking at about 0.6 m/s on flat ground. Readme file which gives brief description of each of the variables. Matlab programs for reading and plotting the data. Probably will need minor modifications to find the proper directories, etc. The following is raw data from Spring Flamingo walking with a human style configuration on flat ground. Fast walking data of Figures 7-2 and 7-3. Disturbance rejection data of Figure 7-6. Speed Control data of Figures 7-5. Only the first two papers below are specific to Spring Flamingo. The others were written before Spring Flamingo was built, yet they still apply to the robot. Williamson, Matt Series Elastic Actuators, M.S. Thesis, M.I.T. Department of Electrical Engineering and Computer Science, 1995. Pratt, Gill A. and Williamson, Matthew M. Series Elastic Actuators Proceedings of IROS '95, Pittsburgh, PA.
Pratt, Williamson, Dillworth, Pratt, Ulland, Wright Stiffness Isn't Everything Proceedings of ISER '95, Stanford CA.